Sorry in advance for the lengthy post. I'm an American citizen who spends most of my time outside of the United States traveling for fun. I've never had a problem and I have no criminal history. I've never overstayed a visa. I own a business with employees that allows me to work from anywhere. As a result, I don't have a permanent residence anywhere and I very rarely need to be in the United States for work. A couple weeks ago I drove to Canada for the first time to go skiing in Whistler. I had a couple boxes of unused ammunition in the car from a recent visit to a gun range (but no gun). My plan was to give the ammunition to the US border exit gate before I reached the Canadian entry gate. Well, there's no US exit gate - it's just the Canadian entry gate. I declared the ammunition, the Canadians searched my car, and they found a marijuana vaporizer with two cartridges of oil and a small tin of coffee beans. Marijuana is legal in all the western coastal states and I had forgotten it was in my car. The Canadian officer told me the primary reason for entry denial was the lack of permanent residency. The Canadians put a seven year flag on my passport for the drugs which means I'll be searched every single time I try to enter. The USA guys searched me on my way back and confiscated the ammunition and they have on record that the Canadians found marijuana. The very next day I signed an apartment lease in Seattle, printed off all my current bank statements, cleaned out the car, left some stuff behind at the new apartment, and entered Canada without an issue after providing all the supporting documents. The officer again reiterated that for future visits they want to see things like utility bills sent to my Seattle residence and they granted me a 2 week visa. Will this visa denial on my record negatively affect my chances of entering other countries? The marijuana thing seems very serious to me, even though I wasn't arrested for anything. I feel like when I answer "yes" to "have you ever been denied entry" in future entry documents to other countries I will just get an instant denial and be stuck in limbo at an airport, and this instant denial will only serve to be yet another entry denial on my record. I think that even if I manage to get into Canada a million more times in the future this one incident will haunt me forever. I know that countries like Japan really don't like marijuana so I feel like perhaps I screwed myself really badly this time. I assume that all countries can see this visa denial in a permanent database. My passport doesn't have a denial stamp from the Canadians but I assume this doesn't mean anything - it's somewhere in a database that all countries can now see. Were you really “denied entry” to Canada? Check your paperwork and your passport carefully. Often what Canada does for minor offenses is to allow you to “voluntarily withdraw” your application to enter Canada. You still get turned back at the border and a strike in your record on the Canada side but as you voluntarily withdrew your request to enter, it does not count as an entry refusal. update: note that being given an “allowed to leave form” isn’t necessarily the same as a voluntary withdrawal. Some “allowed to leave” forms will specify that you were found inadmissible, give the section of the immigration act you violated or didn’t meet, and note that you are leaving voluntarily (ie not in handcuffs) -- in these cases, you were denied entry and should declare this when asked. Other "allowed to leave" forms do indicate that you voluntarily withdrew your application and there is no declaration of inadmissability. You need to check whatever paperwork you were given carefully. For the OP, that you don’t have a denial stamp in your passport and that you were let into Canada a few days after strongly suggests voluntary withdrawal. But you need to double-check especially if you plan on traveling to other countries as visa-waivers often require no denials on your record. If you’re unsure and don’t have the paperwork, ask the CBSA agent next time you pass through or ask your local Canadian consulate. Voluntary withdrawals are not entry-denials and so do not have to be listed when asked if you've ever been refused entry or had a visa denied. However, if you are explicitly asked whether you've ever voluntarily withdrawn an application to enter at the border, you do of course have to respond affirmatively. As far as the weapons and drug charges, you again need to be certain of what happened: were you arrested? were you charged? did you plead guilty? were you sentenced or fined? or did you voluntarily give up the contraband in lieu of being charged/arrested/fined? These distinctions make a big difference to other countries when using visa waivers or making visa applications. been deported or removed from Japan or any country for overstaying your visa or violating any law or regulation? been convicted and sentenced for a drug offence in any country in violation of law concerning narcotics, marijuana, opium, stimulants or psychotropic substances? Based on what you've said, it sounds like your answer to both is "no." When you are asked whether you have ever been denied entry, the correct answer is Yes. I was turned back simply because I carried too much things in my car for my intended duration of trip. Nothing stamped in my passport, no implicated crime committed, no inadmissibility or anything like that -- just an "Allowed to Leave" form given, which says "I hereby voluntarily withdraw my application to enter Canada and agree to leave Canada without delay." 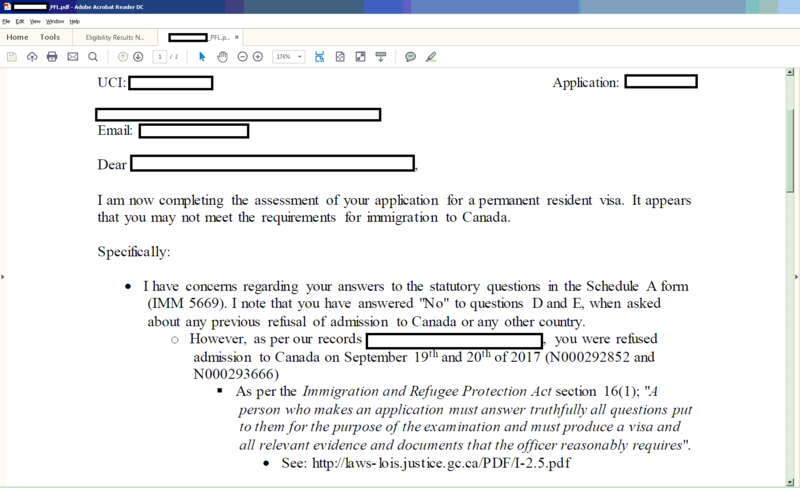 Scroll forward a bit, when I subsequently applied for Permanent Residence, I had a question, "Have you ever been refused entry into Canada? ", "Have you ever been refused entry into any other country?" I answered No to both, and lo and behold, they served me with a Procedural Fairness Letter, which comes before a Misrepresentation charge. I attach the image of the PDF of it, with my information whited out. In the end, they gave me 7 days to provide them with additional documentation/explanation to allay their concerns, or else face the charge of misrepresentation. God has helped me, to where this refusal was recent enough, and my photographic memory worked well enough, that I could quote how the border officer explained this Allowed to Leave for me -- and also, they had record of the conversation in their system, to where they confirmed that the border agents messed up when explaining to me how I should fill this out on future applications; I also had records of the phone calls where I called the embassy to ask about this -- so after doing their investigation for almost 4 months, they decided not to raise the charge of misrepresentation. But the point is, if you are asked about being denied, the truthful answer would be Yes. So that's the bad news. The good news is, that Japan does NOT share the same immigration system. The countries able to see this refusal are, US, Canada, UK, Australia, and New Zealand. Hence, unless they found out about this refusal in another way (e.g., the "Drug watch" flag might be visible to all countries; I don't know), the Japanese wouldn't know that you have been refused from entering Canada. Nobody hardly anybody is ever "stuck in limbo" at the airport. That happens only in movies. If you are not allowed in, you will be put on a plane to your country of departure even if you have no return ticket with you. You might get a hefty bill for that flight, however. If you want to minimize the risk of being held on the border or the airport, you can often apply for a visa in advance even if you could get a visa on arrival instead. Generally there is no instant denial. Each country will evaluate your case against their priorities. I think parts of Europe would be much more upset about the arms smuggling charge than the drugs. The Canadian immigration authorities don't store American citizens' fingerprints. Without fingerprints, no other country will know about your denial of entry to Canada. For citizens of some countries for which Canada collects fingerprints, any denial of entry or visa refusal could potentially be found out by members of the FCC--UK, USA, NZ and Australia. However, it would be an entire different ball game if you were arrested or charged with a criminal offence. Not the answer you're looking for? Browse other questions tagged canada denial-of-entry drugs or ask your own question. If there's no record of a traffic ticket, does it exist?